It's that time of year again. Thanksgiving is associated with so many things, including time with family, holiday sales, football, and eating to the point of exhaustion. 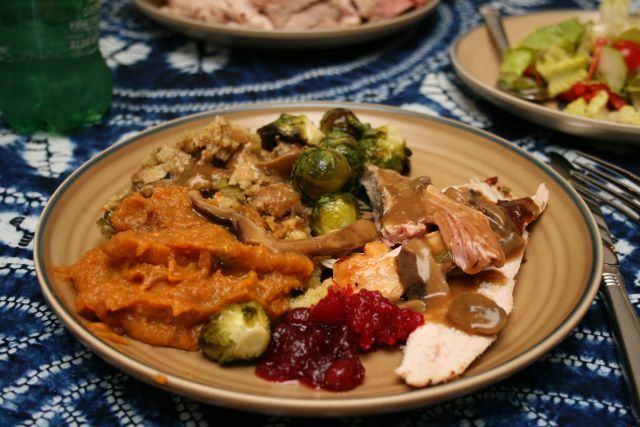 What about actually giving thanks? Is there room this weekend for such sentiments? Research by Robert Emmons and his colleagues at UC Davis have repeatedly shown the benefits of expressing appreciation and gratitude. In his initial study (Emmons & McCollough, 2003), people who kept a weekly gratitude journal reported more optimism, fewer physical problems, and more physical exercise relative to people who recorded neutral or negative events. These findings should not be too surprising, especially as religions across the world have practiced extending prayers of thanks. In Christianity, for example, saying grace is an exalted tradition to offer thanks to God for sustenance and life on earth. Consider for what you feel grateful over the past year. Name 10 things as you finish the sentence, "I feel grateful for ....." Whatever you list need not be particularly grandiose. You don't have to thank the cosmos for your existence, but your statements should reflect your true sentiments, not we you think you should feel. You might to allow yourself a few moments to fully consider something (or someone) before you decide if it's list-worthy. For example, you might not feel particularly thankful for someone in your family given the headache that he/she caused you today. However, if you sit long enough in contemplation, you might be able to see through this storm of an ill mood and find true gratitude. Share your feelings of gratitude with friends and family. Early in the day tomorrow, arrange a time in which you all will discuss thanksgiving. You can center this practice around the holiday meal, and go around the table to discuss things for which each person feels grateful. Think about the people who have helped you get to this point in your life. Who has helped, loved, and supported you? Send them a wish of thanks, either mentally or by expressing your appreciation directly to them. Reconsider your anger or bitterness directed at family members. Often, we carry a lot of "baggage" when it comes to our families of origin. We usually tend to focus on all the injustices that we suffered with little appreciation for the (likely) fact that our parents and siblings did the best they could with what they had. For example, it is unlikely that your parents purposefully tried to disrupt your emotional growth. Instead, they--as outwardly imperfect as we are--likely tried their best to manage the difficulties of raising a family. The results? Not perfect, presumably. However, maybe there are some things for which you can feel appreciation or even gratitude. Maybe they sacrificed a lot for you to learn the piano or go to summer camp. See if it's possible to notice and get in touch with helpful, supportive ways in which your family has loved you. Help someone. Offer to carve the turkey, cut-up food for children at the table, or even--horror of horrors!--do the dishes. Especially if you don't want to have a "touchy-feely" conversation with your family, extend your gratitude practically through your actions. Whatever you decide to do, give it away freely with no expectation of acknowledgement or payback. Just do it because it feels right and matters to you. So I've been away on Cape Cod for the past two weeks. People don't get angry there. This morning, my local morning train was not in service, so I had to find a bus, along with the throngs. Throngs make people tense. At a certain point the bus driver stopped for someone who was waiting at a bus stop, basically to tell him that he couldn't allow him on, because the bus was so crowded. The man was not happy and got on the bus anyway. The driver didn't like this. They got angry at each other, fairly loudly. Oh, I'm back in the city. I immediately felt my body respond, my head started spinning because I had been free of this sort of conflict for weeks, and resented that I had to feel this, when I wasn't even involved. So I resented, and listened to myself and my body, trying to find opportunity through annoyance. Lo and behold, I found fear, because of course I found fear, I always find fear. And I didn’t like this fear. And I listened more and I found sadness, and of course my own anger, and confusion, because being mindful didn't make everything all better. And it's not supposed to, it's just supposed to help us be more mindful. On Friday and Saturday, I attended a conference on meditation and psychotherapy co-sponsored by Harvard Medical School. The theme of the conference was “Wisdom and Compassion”, featuring the Dalai Lama as the main speaker. He answered questions posed by prominent scientists and clinicians, including Drs. Jon Kabat-Zinn, Richard Davidson, Steven Pinker, Marsha Linehan, Bessel van der Kolk, and Judith Jordan. Not surprisingly, the Dalai Lama emphasized the importance of mindfulness. He explained that wisdom and compassion can be cultivated through “mental engagement” with an object and aspiration, respectively. In other words, we become wise through deepening our understanding of things around us, and we become compassionate by focusing on compassion. He noted that mindfulness is important for both: it helps us maintain our focus, whether on a particular fact or goal. Dr. Judith Jordan, one of the Founding Fellows and current Director of the Jean Baker Miller Training Institute, inquired about cross-cultural differences in relationships and autonomy. She observed that Western culture (and psychotherapy) emphasizes separateness and individuality, while Eastern cultures emphasize interdependence and collectivism. It is validating to hear the Dalai Lama note that there is something about city living that’s different--something that requires us to be especially mindful and present given our vulnerability to distraction, preoccupation with money, and self-aggrandizement. It underscores the important cultivation of urban mindfulness through both formal and informal practice. So, please continue to practice and visit our site regularly. I welcome your comments and questions, too. Together, we can build a community in which we experience city living in a way that promotes peace, awareness, and purpose. P.S. You might be wondering, “What was it like being with the Dalai Lama?” Of course, it was interesting to hear his perspective on many matters. However, two things made a bigger impression on me: (1) his playfulness, and (2) his ignorance. He was quick to smile during he day, and often giggled and joked with panelists. 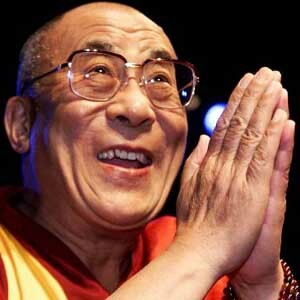 It reminded me of a quote from Jon Kabat-Zinn on the following day: “Life is too serious to take seriously.” Also, following a pregnant pause, the Dalai Lama often answered questions with a well-considered “I don’t know.” While he is quite learned and smart, he also recognized the limits of his knowledge. So, if he did not know the answer, he just said so. Quite refreshing! This past weekend, I participated in a volunteer-led clean-up of a neighborhood in Brooklyn. My work slot was two hours long. When I showed up, they gave me a bag and a set of tongs: “Go pick up garbage.” I was told. The day was gloriously beautiful and sunny. Everyone was out in the street and enjoying the wonderful weather. Happy people were walking dogs, pushing strollers, and having lunch al fresco. And then there was me. A T-shirt clad dude using a robot-like claw to pick-up cigarette butts while trailing an obnoxiously large trash bag. It might have looked normal if there were other people picking-up garbage, too. But I was alone. All I needed was an orange jumpsuit to complete the ensemble. Now, I could have brought mindfulness to bear on the activity (uni-tasking! What a concept! ), and enjoyed the nice weather like the other people around me. Instead, my mind came up with a myriad of thoughts and distractions. First, I wondered how other people would see me, and I felt embarrassed. “People must think that I broke the law, and I’m doing community service or something.” I thought. Then, I became angry. “How come there are 15 people at the volunteer station and I’m the only one cleaning the street?” I wondered testily. And, “Doesn’t anybody know how to use a garbage can anymore?! How did your used latex gloves wind-up on my sidewalk? !” Then, I found the whole process delightfully absurd and called my wife, repeatedly. I shared all of my musings. “I’m hanging up now,” she said. Gradually, the endless torrent of thoughts started to relent (“This is a great exercise to cure narcissism! Wait, didn’t I think that already?”). I slowly was becoming more engaged in the activity. Focused on the area around me, I was more alert to the bits of detritus on the sidewalk and in tree pits. Even my posture changed. I went from a hunched, “don’t look at me” pose to standing more erect and comfortable. The trash pick-up became neither embarrassing nor noble. It was neither regrettably necessary nor an act of civic pride. Without these thoughts and judgments, I was simply picking-up garbage. Nothing more, nothing less. Just like garbage on the sidewalk, our mind is littered with thoughts. Our internal dialogue is often “talking trash,” which we take seriously. Perhaps implicitly, we consider our thoughts to be very important, at least until the next one comes along. Then that other thought is discarded. If we’re not careful, we’ll end up with a mind cluttered with throw-away thoughts that only get in the way of our direct experience. Through mindfulness practice though, we can work on keeping our mind relatively litter-free. It just takes a little time and effort. I ride city buses all the time. I like buses. I prefer them to the subway. I love looking out the window and watching the world go by. My mind wanders. I daydream. But there is one thing that happens on a bus that has the capacity to totally "undo" me. Whenever, I see someone who is relatively healthy, young, and totally oblivious take one of the seats that is designated for the "elderly and or disabled," at the very front of the vehicle, behind the driver's seat, I lose all my mindfulness training and I am about ready to blow a fuse. Last week when I was on the bus in my Queens neighborhood, I witnessed a particularly acute example of such behavior. The bus was very crowded and a boy around 15-years-old took one of those seats. He had his iPod and he was totally involved in whatever music he was tuned into. Unfortunately, he was completely tuned out to anything else. A very fragile, elderly woman got on the bus and was looking around for somewhere to sit. My immediate impulse was to get up for her, but then I reminded myself that the reason I was so grateful to have a seat was that the arthritis in my left knee was causing me a great deal of pain and that I was in no shape to play good samaritan. I, then, argued with myself as to whether or not I should say something to the boy. He bristled with very defiant and oppositional energy. I felt totally conflicted. Was it really my business to intervene and speak to the teen? What was going on with the woman? What was preventing her from speaking up for herself? Where was everyone else? How come no one was getting up and giving her a seat? What about the bus driver who was a witness to what was happening- what was going on with him? I didn't know what to do. I ended up doing nothing. This didn't feel very good to me. I see myself as a person of action yet, this incident showed me that there are times when doing "the right thing" isn't always possible. I wanted to help the woman but I didn't have a clue as to how to do so. In the past, I actually have spoken to people who have wrongfully occupied those seats. Every time I have done so--no matter how diplomatic I have been--I have been the recipient of curses and hostility. I was afraid that this would happen again. I have asked myself if it is possible to look at this episode in a mindful way. This incident has taught me the importance of 'acceptance.' I need to accept that people often don't do "the right thing," including myself. We live in an imperfect world with imperfect people. Remembering this, I have concluded, is the first step to mindful wisdom.